As I know that starting in R2014b, MATLAB graphics titles use a bold and slightly larger font for better visibility. I am using R2014b, what happend to my plotting style? The left is a example picture from help center, the right is my plotting. You can see the difference between the titles. From your screenshot, it looks like your locale is Chinese. Is that correct? It turns out that the visual designer who added the bold to the title felt that it didn't look good with Kanji characters because they tend to be quite a bit more complex than Roman characters. The way this was implemented was to look at the locale. If is CN, JP, or KR, then the factory default for the title's FontWeight is normal instead of bold. In your example, this is probably not a great decision. Even though your locale is CN, you have Roman characters in your title. We should see if we can find a way to be smarter about that. You can workaround the factory default by adding something like this to your startuprc. Thank you! You solved my problem. After I changed the language from chinese to english, the title font is bold. You are right, chinese characters are too complicated. 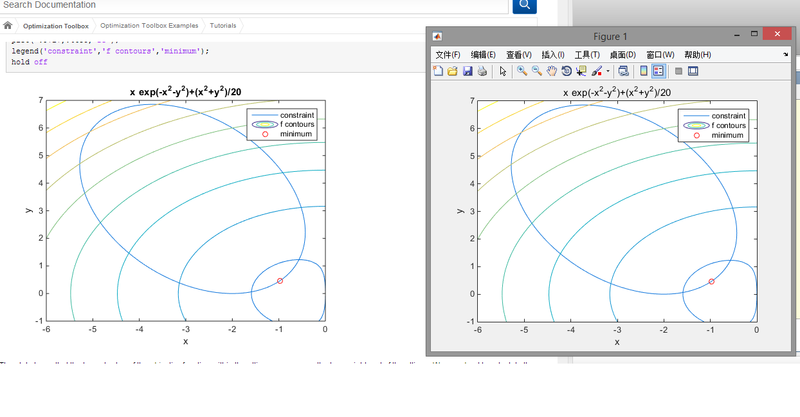 It could be that the font MATLAB actually uses to create the figure is different than what's in the help. I don't know how they got that picture in the help. Maybe the process of copying and pasting it in there caused things to adjust slightly. You know that you have control over the appearance of the title via input arguments like 'FontSize', etc. in the title() function. This is what I typically do.